At this point in your Six Sigma project, the intent of your brainstorming is to generate and capture a list of possible factors (the Xs) that may be influencing the key output (the Y) of your project. The basic format for brainstorming is well known: You bring a group together and ask everyone to offer possible ideas on a topic. Effective brainstorming defers judgment; the goal is to gather as many ideas as possible, even unusual ones, and critiquing suggestions at this point will stifle the group’s creativity. Two of the best brainstorming tools are affinity diagrams and fishbone diagrams. An affinity diagram is a special form of a brainstorming session where team members each write their ideas on sticky notes, one idea per note, and then place the notes on the wall. After everyone’s notes are posted, the team members work together to group similar notes into natural categories. The resulting groupings can be insightful and revealing. One of the most basic yet powerful brainstorming tools for capturing all the potential factors in your system is a fishbone diagram, named because of its bony, fish-like shape. Sometimes a fishbone diagram is called an Ishikawa diagram, after Kaoru Ishikawa, who first suggested its use. The information documented in your fishbone diagram is invaluable. 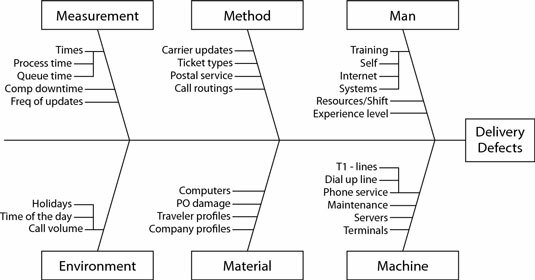 A properly executed fishbone diagram forms the foundation for the analysis phase of the DMAIC project road map because it effectively captures a large number of potential inputs. A meager fishbone diagram makes the rest of your project that much harder. A fishbone diagram is so simple that you can draw it on a whiteboard, a notepad, or even a lunch napkin. Start by placing the Y of your project — the key output — at the head of the fish. Then, to jump-start your brainstorming, draw a backbone with six main bones coming off to the sides. These bones represent main categories of captured factors: man, machine, method, measurement, materials, and environment. These six main bone categories are just suggestions. Use whatever categories fit your situation. Some Six Sigma practitioners add the categories of maintenance and management to their diagram. Some in the service industries use the categories of price, place, promotion, people, process, and physical evidence to better help them get started. With your cross-functional team members, think of any and all factors that may have an influence on the key output. Write each of these factors on a smaller bone on the fish skeleton as an offshoot of the appropriate category. Ideas usually come in bunches as team members leap off the suggestions of others, and soon your team has ideas identifying what factors may be influencing the key output.